According to a report by The Investor, in an interview in Taiwan over the weekend, the Samsung CEO DJ Koh revealed the plans of the company to announce the Galaxy Note 8 in August. He stated that the availability of the device will happen in two phases. Initially, the sale will debut in September in the Korean, the U.S. and the U.K. markets. The second phase will debut in October for the rest of the world. A recent report pointed out that Samsung is in plans to sell 9 million units of the Note 8 initially. This report adds more credibility to the recent one hinting that the Galaxy Note 8 might see the light of the day on August 23. Though the date is yet to be confirmed, we know that it will be launching sometime in the next month. 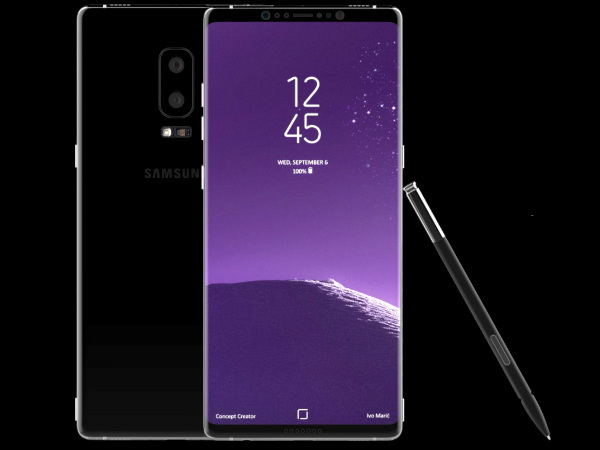 The Galaxy Note 8 is the direct successor to the ill-fated Galaxy Note 7 that was recalled months after its launch due to the battery explosions that happened in several parts of the world. There are big hopes pinned to the Galaxy Note 8 and we do hope that it doesn’t push Samsung into trouble like its predecessor. Going by the existing rumors and leaks, the Samsung Galaxy Note 8 will feature a 6.3-inch Infinity Display panel with an aspect ratio of 18.5:9. The device is likely to make use of the Snapdragon 836 SoC paired with 64GB/128GB storage capacities. It is believed to be the first Samsung smartphone to feature a dual lens rear camera setup. Also, the device is rumored to feature a rear-facing fingerprint sensor and a 3.5mm audio jack on board.